Tweeting… blogging… creating an online identity… we had a great time giving our Techno-taster workshop at the Museums Association conference in Edinburgh yesterday. 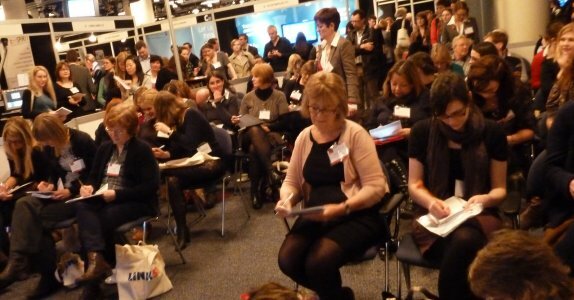 Ours was the opening session in the Museum Practice workshop programme, and as last year, this strand of the conference drew crowds all day. We shared tips for brighter blogging and tighter tweeting, including examples and ideas about ‘voicing’, cutting and feeding your digital output. We also asked the question ‘which UK museum or gallery has the biggest Twitter following?’ and the answer is the Saatchi Gallery, which is also the venue for our full Digital TextWorkshop on 5th December 2012 – so we hope you can join us then! Digital TextWorkshop: Wednesday 5th December 2012, 10.30am-4.30pm, from only £75, at the Saatchi Gallery in London. From the web to twitter, it’s never been more important to get your digital text-writing up to scratch. Digital TextWorkshop will cover all the tips and tricks of effective digital communication, with input from experts from inside and outside the museum field. We’ll cover writing for blogs and websites – as well as how and why you should tweet.